jv16 PowerTools 4.2.0.1845 - представляет собой набор утилит для комплексной работы с реестром (очистка, правка, автозагрузка, установка/удаление) и файлами, очистки дисков и управления компьютерами в локальной сети. В состав программы входят следующие утилиты: Software Manager, Startup Manager, Registry Manager, Registry Cleaner, Registry Finder, Registry Find and Replace, Registry Monitor, Registry Compactor, Registry Information, File Finder, File Cleaner, File Organizer, Duplicate File Finder, File Tool, Directory Finder, Directory Tool, Disk Wiper, Start Menu Fixer, History/MRU Cleaner, History Manager, Cookie Manager и Privacy Protector. 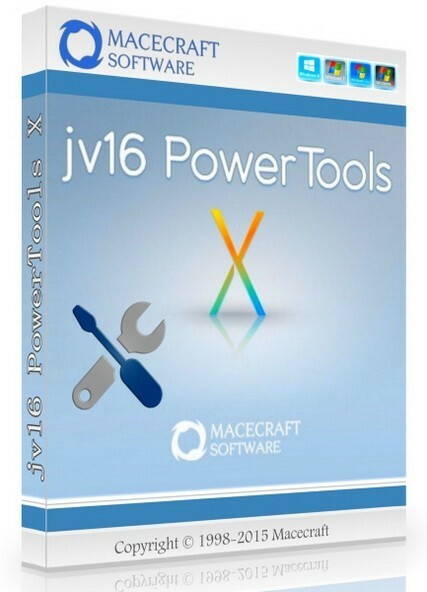 • Fix: Improved the overall stability of jv16 PowerTools. • Fix: The software can display a Division By Zero error message. • Fix: After Clean And SpeedUp My Computer is finished, the Select menu item is not always visible. • Fix: Improved many memory leak issues, possibly causing Out Of Memory error to be shown, especially if jv16 PowerTools is being used for a long time in one session. • Fix: There can be a large number of variation of found items in Clean And SpeedUp My Computer scan results, even if no errors were fixed or no items deleted between the scans. • Fix: The first time jv16 PowerTools is started, it can display an incorrect value of -1 registry health. • Fix: The Check for Updates may not always report of a new version even if there is one. • Fix: The Main Window can report an under 100% Registry Health even if Clean and SpeedUp My Computer finds zero errors.